Posted on July 25, 2018 at 1:00 pm. Overview: In Kansas City, MO, electrical street lighting is the norm. However, a remote T-intersection where N. Brighton Avenue meets N.E. 72nd Street lacked access to power and needed lighting for safety. Approximately 10 years ago, three Sol lighting systems were installed here, but recently required an upgrade. 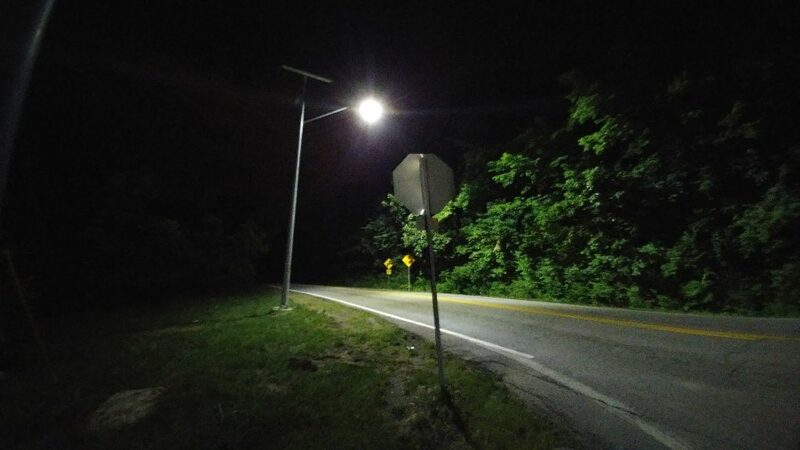 “Plus, the old technology had a much lower lumen output than is currently available,” explains Bryan Carter, a Project and Construction Manager for the City of Kansas City Public Works Department’s street lighting section. The City decided to replace the lights; this time, grid power was more readily available, but still several hundred feet away and only high voltage. “The costs of extending the power and having the utility install a transformer were significant,” Carter says. “This led us to look at updated versions of solar lighting systems.” The City explored several options, but ultimately chose to work with Sol again. “They provided the light levels needed at this intersection, and we had seen good performance out of the previous model,” says Carter. Requirements: Since the lights were used on the roadway, they had to meet the luminance and illuminance values the City required. “The fixture and solar engine we chose were the highest lumen output that was available in our area,” Carter says. Our Solution: Through distributor Black & McDonald, which has its US headquarters in Kansas City, the City ordered 3 new Sol solar lighting systems, installing one on each approach to the T-intersection. The model used was a predecessor to the newest Sol model, the EverGen, and thus features many of the same benefits including high lumen output, built-tough design, and accurate specifications to ensure they work as expected for the long term. While the new Sol EverGen solar lighting system had not yet been released when Kansas City completed this installation, it would be an effective solution for a remote location such as this: the EverGen includes LightGuard remote monitoring to help avoid unnecessary site visits and ensure peace of mind that a light is working as expected.